There’s a small, otherwise nondescript hill in New Brunswick that has been baffling visitors for over 80 years. Originally a cart path, when automobiles became more common in Moncton in the 1930s, drivers discovered a mysterious phenomenon occurred on this small hill. If a driver takes their foot off the car brake at the bottom of the hill, they will be shocked to find their vehicle rolls backwards—uphill. The largest axe on the planet contains a time capsule that seems like it may never be discovered. In these “mystery spots,” what appears to be an uphill incline is actually part of a larger downhill incline, misinterpreted by our brains because of the way the slopes are situated mixed with little or no view of the horizon line. Water, balls, and tires appear to be rolling uphill when really they’re rolling downhill just as they should be. Many magnetic hills are only discoverable by those in the know, but not the one in Moncton. 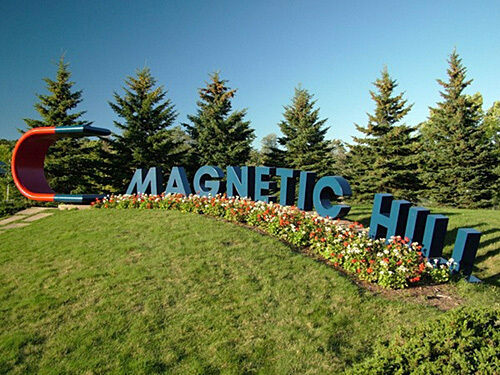 The hill is a popular tourist attraction, and visitors can find it by looking for the massive magnet sign. At peak season, there is a minimal charge of around $6 CAN per vehicle, a small price for the fun of experiencing this optical illusion. The attraction is located off of Trans Canada Highway 2. Take Exit 450 (Highway 126), which is adjacent to the Magic Mountain Water Park and Wharf Village. There are lots of signs that direct you to the attraction.